Information Junk: Ho Ho Ho! 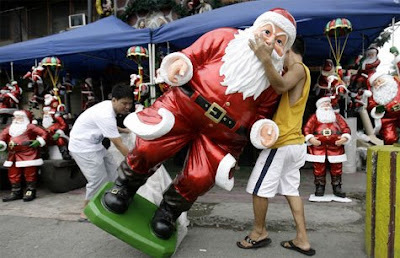 A man arranges a large Santa Claus figure outside a shop in suburban Manila, Philippines. Shop owner Antonio Santos said that exports of their Santa Claus figures, that sell from $1-$200, depending on size, have declined due to the current global financial crisis.